The Hotel Adler is oasis of peace in busy Milan, where you can find pleasant accommodation in rooms with socket for connecting up to Internet, private bath with hair dryer, air conditioned and television with satellite channels. Our hotel three stars offers its guests a pleasant and welcoming atmosphere, characterized by the high quality of their services, ideal for both holidays or for business trips. On the ground floor there is a television room with a reading corner and the breakfast room, where a plentiful sweet and savory buffet is prepared in the morning and where guests are served aperitifs and snacks in the evening. Breakfast is served in an annexe overlooking a lovely garden. Reception is open 24 hours a day with our multilingual staff and every morning, from 07.00 to 10.00 a plentiful, appetizing breakfast is served. Plus send and receive faxes, request transfers for the airports and station, ect., at the reception area. At the Adler Hotel it is possible to spend the night in 23 comfortable single, double, triple and quadruple rooms (family room) with private bathroom and hairdryer. The rooms, of this 3-star hotel in Milan, are furthermore equipped with individually controlled air-conditioning, Internet Wi-Fi, TV, heating and direct dial telephone. Welcoming rooms with simple furniture and private bathroom. 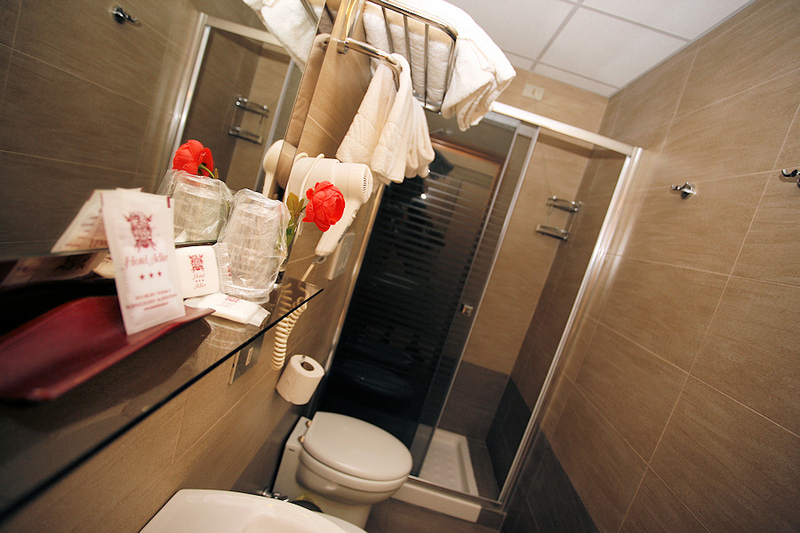 All you need for a comfortable and convenient stay in Milan. Ideal for couples or business partners, private bathroom with shower, air conditioning, WiFi free. Perfect for a pleasant and affordable stay. Perfect for families or groups of friends on holiday in Milan. Rooms with private bathroom with hairdryer, kit courtesy and Wi Fi. Pets are welcome and on request, it is available for a cot / bed for a child up to 3 years.